Entries tagged with “Gallery 1412”. Chaostic Magic is Corey Brewer on guitar and Eric Ostrowski on amplified violin. They each had a little amp and shared a big PA horn that was placed behind a small screen upon which a set of slides were played. The slides were fairly abstract material usually looking like two images from ancient books somewhat overlaid. The music was very loud, aggressive, feedback drenched noise. I wasn’t so into it but there were a couple of nice moments. You can make serious noise with an amplified violin, but it isn’t really so different from what you’d get from a guitar if you bowed it. It didn’t go on too long maybe 15-20 minutes. The slideshow ended and so did the show. I’d come to see the Gust Burns Quartet who have played a couple of gigs recently. I was familiar with all of the musicians and have seen them with Gust in a larger ensemble a couple of months back. The quartet is Gust Burns working his dowels inside a baby grand piano, Mara Sedlins working with extended techniques on the viola, Mark Collins wringing fairly uncharacteristic sounds out of the double bass and Wilson Shook sounding more like circuit bent electronics then the alto saxophone he utilized. The sounds were all very discrete with usually only a subset of the quartet playing at any given moment. The string players mainly worked with dry scrapes though Mark would use other tools on his bass to eke out some more varied sounds. Length of tones usually tended toward a couple of bow strokes in duration. Wilson worked with crackles and pops which coming from his sax with various preparations was really great. There were a number of gaps in the performance sometimes arising naturally but other times feeling a bit forced. In general it was a slow, meditative deliberate performance that I quite enjoyed. It was particularly interesting to me that this all acoustic quartet was working in eai territory. There is a trend among some of the musicians in the Seattle area to do this, eliminating electronics but working with those textures. At times it sounded like say Lachenmann scoring for a chamber group in the style of TV Pow. As I mentioned above they did use silence but I usually got a feeling that this was because it was a goal. As if they were directed to do so now and again. For instance everyone would drop out and one person would be playing and it’d seem like that player would rush to stop in order to have a silence they “should” have. Obviously speculation but that was how it felt to me. The other criticism I would add is that with the dowels and two string players there was a lot of overlap of sound, especially considering the techniques used. A bit more varied palette would I think be really rewarding, something like a percussionist would fit in really well. Even better in my mind would be a very tasteful electronicist, though that could go against this trend that I’m sensing. Anyway caveats aside I really enjoyed this performance and like seeing more and more of this kind of stuff in Seattle. I’ve seen Gust Burns in a number of ensembles over the last few years but last night was the first time I’ve seen him play solo. He was again playing his constructed ‘inside piano’ that I first saw him use at few weeks back in trio with Jeffery Allport and Nate Wooley. At that show he was not amplified but tonight he was running through the Galleries PA. He had two contact mics on the soundboard and an overhead mic all fed into a little mixer. I was definitely excited to hear this development as I have myself worked a lot with contact mics over the last few years and particularly like their use on acoustic instruments. My interest in using them is to reveal the little sounds I could make with my prepared harp and I assumed that Gust would be doing similar things. 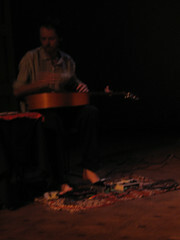 The show started around 8:15 and Gust played for around 20 minutes in a continuous improvisation. The sounds that he generated were as I have described before: high keening tones from the upward stroked dowels and dry scraping sounds from the downward stroked dowels along with various overtones and resonances from the instrument as a whole. T the use of amplification brought these sounds to the fore but as I suspected, reveal so much more. The sound of the hands themselves on the dowels making little squeaks and rustles, tension on the strings making tiny pings and soft gonging sounds, more dramatic metallic ringing sounds and hollow thuds as the dowels were slid along the strings to various positions. This plus the reverbation of using a room mic, some overdriving of the contact mics and the occaisonal whine of feedback. The structure of the piece was created through switching between the dowels. He’d stop the sounds he was making, let the dowel rest on the surface and switch to another one. This provided a natural gap between the more continuous sounds that he’d generate in each of these sections. It gave the piece a feel of having movements and the varied tones he’d use for each of these enforced that feeling. He began with mid-range dry scrapping tone that rang out with room reverb and the sounds of his hands. The middle bit used the purer tones with a shorter dowel in the upper strings with layer of overtones and incidental squeaks. The end had a much lower section at first and then by sliding the dowel in the strings concluded with a more mid range segment to bring it full circle. A short improv but one I really enjoyed and got a lot out of. 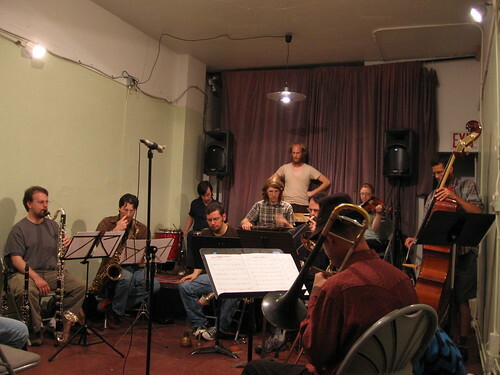 Nate Wooley’s Composition for Large Improvising Ensemble. This week NYC based trumpeter Nate Wooley played a series of shows in the Pacific NW, including two nights at Gallery1412. I missed the all brass show on Thursday but managed to get to the Saturday show which featured a trumpet/percussion/”piano” trio and a large group performing one of Nate’s compositions. I’d slept poorly the night before and upon finding my automobile reluctant to turn over I near abandoned the enterprise. But I walked around a little bit and gave it another go and the car decided to play along. It’d been a warm, sunny May day which is not necessarily the best circumstance for Gallery shows, especially if they are crowded. I arrived a few minutes before showtime to find the muscians arriving and just setting up. I walked around Capitol Hill a bit contemplating coffee but deciding that it was perhaps not for the best I returned to the gallery to grab a seat. I read the titular chapter of Morton Feldman’s Give My Regards to Eighth Street before the show began. I’d seen all three of these musicians before, Nate at the 2007 SIMF and Gust and Jeffery numerous times in various combinations. I really have enjoyed these musicians work and I felt that this trio would be a really good combination. Nate of course plays trumpet in various styles, but most interestingly in a rather post Axel DÃ¶rner/Greg Kelley sound oriented style. Jeffery Allport is a Vancouver based percussionist who also works in a pared down sound focused style working primarily with a snare and a floor tom used mainly to resonate other objects. 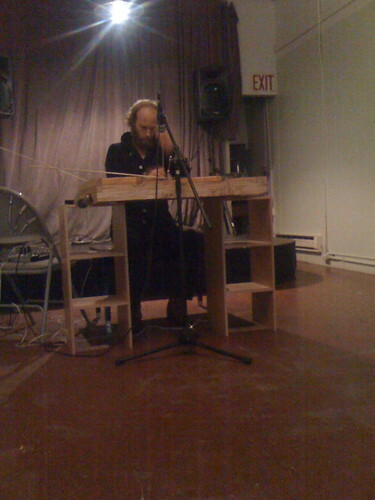 Gust Burns plays piano in various styles but again in the contexts I’ve mainly seen him in it is nearly exclusive by rubbing dowels placed betwixt the strings. For this show though he had constructed a rough wooden box with a certain amount of the guts of a piano recreated within. Like an ultra Lo-Fi DIY version of Andrea Neumann’s instrument sans electronics. Things settled down and the lights dimmed and the three of them sat there in silence for a moment. Shortly Nate removed the mouthpiece from his trumpet and began softly blowing into it as Jeffery began bowing the metal stays on his floor tom. Gust had grab a long thin dowel but as the high pitched sounds from Jefferey’s bowing began he switched to a shorter dowel and sticking it into the strings of his contraption he began to generate a low rustling sound. The piece developed forthwith and for a good space of time lost all acoustic elements and sound like this cobbled together sheet metal walking machine shambling down a rock strewn landscape slowing shaking itself apart. Fantastic sounds totally disconnected to their source. I spent much of this piece not looking at the musicians just letting the sounds come in as a single entity. Things settled down to a near stillness until Nate burbling through his trumpet brought it up to the loudest section of this piece. Jefferey was bowing metal bowls on his drums with what looked like aluminum pie plates in them for a loud-ish buzzing rattle as Gust thumped his frame and stroked his dowels. Slowly things wound down from this point and as it hit zero activity they concluded. A quick conferral and they began a second piece. This one was a bit shorter and had several much less abstract sections which were an interesting contrast. Jeffery began the piece with widely separated single strikes on his floor tom with a mallet. Nate after a couple of seconds brought up a small sheet of brass in front of his muted trumpet and created some muffled rattles and squeaks. Gust grabbed a long thin dowel and using a downward stroking motion on it generated high pitched purer tones. This was a nice combination, spaced out by breaths, dowel length and Jefferey’s slow, slow time. As he beat out this syrupy tattoo he grabbed a cymbal and placed it upon the snare. Soon he added edgy bowed metal to the proceedings and at some point Gust switched back to the dryer more textural sounds. Nate did a section that was nearly free improv-ish, firer, though not too loud, free sounds on the trumpet, in a tonal range if not strictly melodic. Jeffery moved to using a rubber ball mallet rubbed across the floor tom with the low moaning sounds that generated. In the midst of a fairly active section they looked at each and then just stopped. A great sudden ending and a nice contrast to the slow fade out of the first piece. The audience had seemed pretty large for the trio set but at the break the bulk of them got up and got on “stage” as the Large Improvising Ensemble. They were performing a piece of Nate Wooley’s which seemed to be structured along the following lines: You have a certain amount to play but you can play it when you want. Sounds are played at a maximal natural length namely breath length. There seemed to be something on the graphic looking score that could be interpreted as dynamics as several members of the Ensemble chose to play much louder at various times. Overall the piece had this shifting droney quality as there was almost always these long sounds going on, but typically each player would play for a while and then pause for a while. This lead to a steady decrease in density as various players concluded their sections. There was some nice spikier sounds added in by Jefferey in particular but also Gust and Robert playing a lightly prepared guitar and Marc who played his bass with a variety of objects. There were I thought a few “bad actors” who overly dramatically played their louder bits. One of the trombonists in particular really blasted the room with his tones. Overall I’d say I found the piece a bit too dense and a bit to monotonous. It really could have used a wider variety of instruments, more percussion, some electronics say to break up the layers of horns. Some method to insert a bit of space into the proceedings would have been nice, but would have radically changed the nature of the piece. Perhaps if played over the course of an hour instead of the half hour it last it would have naturally spread out. While there often would be up to a half dozen players laying out that still meant there was another half dozen playing. With an extended time frame you’d have to have sections of only a few or no players active. Alternatively you could of course have few musicians involved. For what it was it certainly could have been a lot less interesting and in this fashion I’m glad it wasn’t overly long. It wasn’t the totally mess that most large group things are and there certainly are possibilities here. It will be interesting to see how Nate further develops these compositions. The second day of the Seattle Improvised Music Festival was a busy one for me. The Washington State caucus was early that afternoon (conflicting with Gregory Reynolds workshop alas) and I caucused for Obama whom I’m happy to note swept the state. This day also happened to be my birthday and I was meeting friends for an early dinner before the shows. I also managed to get them to come to the shows, which was great – always like to introduce people to new music. We went out to Araya’s Vegetarian Place a vegan Thai restaurant in the University District. Really tasty food, especially worth noting among the things we had was the fresh rolls, a spicy mango salad and best of all an avocado curry. Recommended. Anyway after dinner it was off to the Chapel for another night of music. I was the first to arrive at the Chapel and I secured us seats in the second row so I was a bit closer this night then last. The Chapel is a really resonant space so you can hear quite well almost anywhere in the room but its nice to have a less obstructed view if you want to watch how the sounds are made. First up this night was the duo of Jeffery Allport and Tetuzi Akiyama. I’d seen this pair along with Gust Burns a couple of years ago and they of course put out the fantastic duo record Live at the Western Front on Simple Geometry. That show and album were Tetuzi playing electric guitar and on this tour he was all acoustic. All of this added up to place this amongst my most anticipated of the fest. The range of sounds that these two used didn’t vary much from the night before. The placement of these sounds of course was what was unique and created an engaging, kind of dreamy world. Akiyama started off using his slide perhaps in response to Allport bowing the side of his floor tom for nice meshed slippery sound. 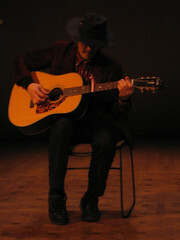 Akiyama soon moved to the Relator style plucked notes and broken chords. Allport picked things up a bit by simultaneously bowing two upturned bowls on top of his drums coarsening these tones by putting crumpled up tinfoil inside. The set reached a peak of volume when Allport moved to the rubber tipped mallets rubbed vigorously across the drum heads. The arcing moaning sound this generated was matched with violent pull-offs from Akiyama adding a contrasting plucked slapping sound. After this things were brought down a bit, Allport gently running forks and dowels over the surfaces until they reached dead silence. Akiyama sat head bowed and it seem nearly a natural ending. A quick fractured chord brought things back after this pause and shortly Allport was back in this time dual bowing the metal trusses on the floor tom. These sounds fading away brought the set to a genuine conclusion. Really a nice set, much less dramatic and varied then when Akiyama is on electric but it fit great in the space and was filled with great overlapping sounds that seemed to hang in the space. I’d first seen JP play at No West last year and his playing was among my favorites of that festival. He plays electric and acoustic guitars with various preparations, objects, effects along with some simple electronic devices. Like Tetuzi he was sticking with acoustic guitar for this festival though he amplified it and used electronics along with his panoply of objects. Mark Collins though was a complete unknown, even to the other musicians. He turned out to be a Seattle area double bass player who played unamplified primarily with the bow or hands. Occasionally he’d use a couple of objects to coax a variety of sounds from his instrument. So pretty much an acoustic string trio for this set. The musicians for this set seemed to pick an area of sound crafting and then work it thoroughly wringing all the detail, possibilities and variety they could from it. The attention and time spent with each technique gave this set the feel of having three distinct movements. The initial one was the most abstract as if the musicians were feeling out each other and finding a way to communicate. Short, sharp, quiet bowing on the bass from Collins, sparse notes and chords from Akiyama and JP generated a hum and then maybe some feedback as he brought his system up. At one point during this tentative first movement a radio grab or sample of Aretha Franklin’s R E S P E C T came through and was immediately cut off. Shortly thereafter JP picked up a very long dowel and placing it upon the body of his acoustic guitar began rubbing the dowel create a nice continuous moaning tone. After this was really worked with things transitioned into an acoustic string trio section. Mostly plucking from the three musicians, with sharp snaps and open chords from Akiyama, gentle tapping around the bridge from JP and before he too switched to a low plucking Mark rubbed a ridged dowel against the edge of the bass. After this was explored for a bit JP began slapping tuning forks and then placing them on the guitars body and strings. At this point Akiyama began eking out these near melodies and after a bit of this JP joined in. This increased in sparseness until the set ended. A real beautiful set, generally very quiet, deliberate and well paced. The all acoustic instrumentation with just the barest wiff of electricity from JP really gelled and provided a riveting experience. Jason Kahn, whose installation I had seen just a few days before is an ex-pat American who has lived in ZÃ¼rich for a number of years now. He runs the Cut label and is a stalwart of the Swiss improvising scene. There has been a certain degree of homogeneity in that scene that has led to a number of self-similar releases that have rather failed to retain my interest. But I’d never heard Kahn solo and after his talk on working with spaces I was curious as to what he’d do. 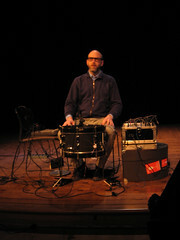 He had a setup of a mic’d floor tom, a small Doepfer modular synth, and a radio. He was able to create feedback with the mic and the drum and he manipulated and modulated this with the synth, mainly creating fairly static pure tones that would interact and interfere with the feedback. I knew this was going to be the loudest set of the night as Jason had mentioned in his talk at the installation that his solo sets trend that way. He said his interest in solo performance was to work with the resonance of spaces and to really bring this out a higher level of volume was required. It never got painfully loud in my opinion, but especially after the delicate nature of the first two sets it was certainly a dramatic contrast. He began by turning on and fading up his radio to create a wash of white noise. This was left to run throughout the duration as a static landscape. He then brought up the mic over the drum till he had a wall of feedback that he could affect and manipulate by interfering in the space between the mic and the drum. He primarily did this by bring a cymbal into that space and moving it around to alter the low wails of feedback. The synth also played its part, he mainly was using purer tones that would interact and change the feedback. He’d do real time patching of this small modular synth and these would change from lower pure tones, to at one point an intriguing fragmented broken tone almost like circuit bent electronics. Primarily he manipulated the cymbal, changed the synth settings and adjusted the feedback volumes but he also tapped on the cymbal, both in the air and laying on the drum and did other more percussive tapping on the drum. For the most part this was a large wash of layered sounds and while it had a structure imposed from working different aspects it had no dramatic shifts or much variation of the sounds. It was interesting and it sounded good in the space, but I found aspects of it a bit tedious. The initial part where he just worked with the feedback, white noise and the cymbal went on far past my interest. The middle section where he primarily worked with the synth I found a lot more engaging as there was more obvious sounds that added variety and contrast to the ever present static and feedback. The end of the set he used more percussive elements though it again was primarily working with the ever present wash of sound. This was an interesting set and as I mentioned above a rather nice contrast to the gentle music prior. I think it could have developed in a bit more interesting way with perhaps a bit more variety in sounds. It rates as one of those things that I’m definitely glad to have experienced but probably once was enough. So a great second day of the festival and a nice birthday present for me :) I enjoyed all the sets in varying degrees and the flow of the evening was really quite nice. Definitely looking forward to the rest of the festival. For all of the pictures I’ve taken from SIMF check out my Flickr Set. A Spiral Cage is powered by	WordPress 4.6.14 and delivered to you in 0.407 seconds using 22 queries.